Are you a savvy c-suite executive, senior executive, or rising star? 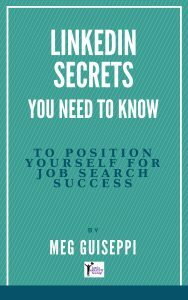 When was the last time you faced a job search, dusted off your executive resume and career biography (if you even needed them to land jobs in the past), and thought about building a job search campaign? ♦ Executive resumes and bios don’t look and read the way they used to. 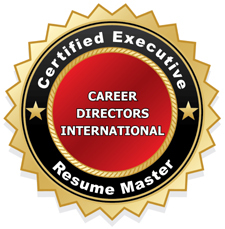 See my Executive Resume and Career Biography Samples. ♦ Personal branding has become a requisite component of executive career management, personal marketing, and job search. ♦ Just as in the past, networking is the best job search method. Hang out where your target audience hangs, so you can position yourself in front of them and connect. Today, your target audience is probably hanging out at LinkedIn and Twitter, among many social networking sites. A successful search campaign needs to include real-life and online networking. ♦ Flexibility is key. You may not find a full-time, permanent position with one company. Temp to perm and portfolio careers (multiple part-time jobs including part-time employment, temporary jobs, freelancing, and self-employment), especially for boomer executives, have become viable strategies. Creating income security, instead of job security, is the new wave. 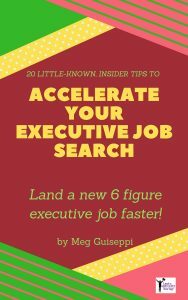 For more details about the new world of executive job search, take a look at my compilation of posts, How To Land an Executive Job in 2011. → How did you land your last job? If you’re like most top-level executives, either recruiters came to you with opportunities when you weren’t job-hunting or you initiated contact with recruiters to get you into a new job. These days you can’t expect recruiters to easily slide you into a new gig. Building several recruiter relationships is just one strategy that should be in your executive job search toolkit. → Can hiring professionals find you online? Do you realize that most recruiters and hiring decision makers search the web (especially at sites like LinkedIn) to source and vet top talent like you? Without a strong, online presence that supports your executive personal brand, you may be invisible to them. Build an interview-generating marketing strategy to accelerate your job search? → Are you ready to leverage the latest trends in online and offline career marketing to capture the attention of hiring professionals and land your next great gig? Then we should talk. Contact me to see if we’re a good fit to work together. A little history about Executive Career Brand and me . . . In 1993, I launched my resume writing business, Resumes Plus LLC, after working several years as the business manager for a similar business – an off-site typing/secretarial support service. In my own practice, my focus quickly moved from merely typing executive resumes and correspondence to writing resumes and career documents, and providing other career services. In those days, before the Internet and social media changed everything about job search and the careers industry, the resume was the thing. Along with networking, just about the only item in an executive’s job search toolkit was a resume . . . and maybe a biography. Branding came into play for me from the beginning, before there was a name for it. Long before Tom Peters coined the term “personal branding“, my mission was to differentiate my clients’ promise of value to their target employers and position them as a good fit for the jobs they were seeking – cornerstones of branding. 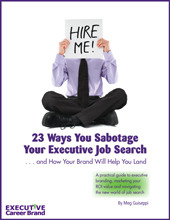 Fast-forward to several years ago when I expanded services and re-branded my business as Executive Career Brand, helping C-level executives prepare to launch and navigate a winning job search campaign. Yes, I still collaborate with them to create resumes, biographies and other career marketing documents. But, because a great resume is no longer enough, I offer my clients a wide range of the offline and online branding and career services needed to succeed in today’s job search landscape. With more than 20 years as an executive job search strategist under my belt, I LOVE the way my business has progressed and transformed over the years. I feel fortunate to be in the careers industry, helping people land the jobs they deserve and work their passion. My Executive Career Brand blogsite is designed to be a hub of constantly updated free information and resources for the c-level and senior-level executive job seeker. Visit frequently or subscribe to have my latest blog posts delivered directly to you. Read more specifics about packages and services.